I am writing to my friends who teach in the Los Angeles Unified School District to encourage you to stay strong in your demands for smaller classes and the resources your students need. Your working conditions are your students’ learning conditions. You should not be expected to pay out $1,000 or more from your salary for school supplies. I am astonished that one of the cities with the greatest concentration of wealth in the world is unwilling to pay what it costs to educate its children. The billionaires who have declared war on public education and who are funding the California Charter Schools Association would not tolerate overcrowded classrooms, obsolete textbooks, and crumbling buildings in the schools their children attend. They should not tolerate such conditions in the public schools of Los Angeles that other people’s children attend, people without their wealth. They want the best for their children, and they should demand the best for all children, and pay for it. Please fight against “school choice,” an idea that was first launched by segregationists in the South to block the Brown decision in the late 1950s. It is now the favorite cause of U.S. Secretary of Education Betsy DeVos, who wants to replace our nation’s democratically-controlled public schools with a menu of “choices,” none of which are as good as public schools. In California, as elsewhere, charter advocates oppose accountability and transparency. Furthermore, charters have been characterized by scandals and fraudulent financial practices, a result of their lack of oversight and accountability. Your superintendent Austin Beutner came to the job thanks to a takeover bankrolled by the charter lobby. He has never been an educator, and you will have to help him understand the importance of teacher professionalism, of reducing class sizes, and of public education in a democratic society. He just doesn’t get it. Public schools are, have been, and will continue to be the foundation stone of our democratic society. If we lose it, we put our democracy at risk. Fight for your students. Fight for public education. Fight for the teaching profession. Fight for a better future for the children and for our society. Your friends across the nation are watching and will cheer you on! 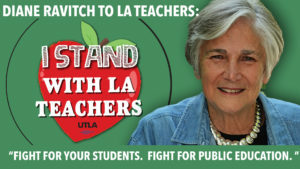 Diane Ravitch is a national leader in the movement to save public education. A former secretary of education, she is a research professor of education at New York University and the founder and president of the Network for Public Education.